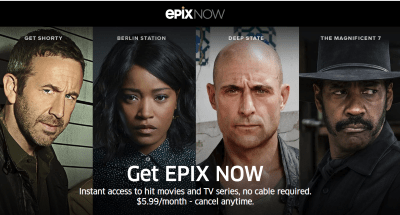 Talk to a Steve at Spectrum and they will not be lowering the monthly cable rate even for those in bundles that included Epix. He stated they look at packages to have the best offer and Epix came out of the package due to the increase cost of Epix due to the change. What is means is they look at ways to save money for Spectrum not the consumer. I asked if they would be reducing the bundle rate or putting in another channel as a replacement the answer was no. Line the pockets of Spectrum is all they care about. They can keep increasing the rates but they will never pass on the savings when something is loss. In my area we loss all fox channels for almost three months. We never received compensation. I wish New York state would go ahead and just get rid of Spectrum. Could have received formal notice! If it doesn’t lower my bill,looking Epix,then I’m done with Spectrum!